Christian Lavernier was born in Imperia on July 27 1979. He has started his classic guitar studies with the teacher of music Mario Senise who led him to the matriculation at Giuseppe Verdi conservatoire in Milan, where he excellently graduated in Paolo Chierici’s class. 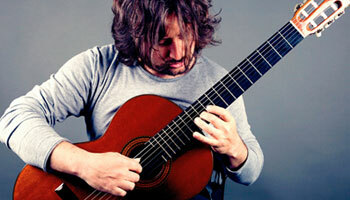 He has attended Masterclass tought by some of the most representative theachers of the international guitar scene. Among them: Alirio Diaz, Conrad Ragosnig, David Russel deepening the study of contemporary music with Angelo Gilardino. He has participated in numerous national and international competitions, among them the most prestigious are: Concorso Internazionale Joannes Brams, Concorso Internazionale Francesco Forgione, Concorso Nazionale Isole Borromee, Concorso Internazionale Paul Harris, winning the first prize in all of them. He has performed at major festivals wherever in the world including: Elise Saìnt-Martìn d’Etiolles (Paris), Accademia Internazionale di S. Cecilia (Rome), 12° Festival Internazionale della chitarra di Cieux (Limoge), Festival Internazionale Andrès Segovia di Linares (Granada), Spring Festival di Aldorf (Switzerland), Guitar Festival di Ceuta (Spain), Guitar festival di Malaga (Spain) , Guitar festival di Vilche (Spain), XXXV Festival Stagione dei Concerti di Villa Durazzo (Santa Margherita Ligure- Italy), Palazzo della Chitarra di Tokyo (Japan), International Guitar Academy Yokohama (Japan), International Guitar Festival in Sapporo (Hokkaido-Japan), International Guitar Academy Muroran (Yokohama-Japan), International Guitar Festival di Morelia (Mexico), International Guitar Festival Magnitogorsk (Russia) , International Guitar Festival di Queretaro (Mexico), International Guitar Festival di Zamora (Mexico), Clarke Recital Hall di Miami (Florida U.S.A), XII Festival International de la Gutarra di Burgos (Spain), International Guitar Festival Ciudad de Bolivar (Venezuela), National Library in Santa Fè (Argentina), Festival Guitarra al Centro Cordoba (Argentina). He has recorded concerts to famous and foreign television broadcasters in Italy, France, United Sates, Mexico, Venezuela, Spain, Argentina, Japan, Russia. He has also collaborated with important musicians and composers such as Azio Corghi and Alberto Colla, as an interpreter. He has a very busy concert work and he takes, as a teacher, Masterclass in some of the most important musical academies and universities in the world: Ceuta’s conservatoire (Spain), De la Rosa’s conservatoire (Mexico), University of Miami school of music (Florida – USA) Guitar Academy Yokoama (Japan), National University of Litoral in Santa Fe (Argentina), Linares Conservatoire (Spain), Ubeda Conservatoire (Spain). He is regularly sent as a juror to major international competitions, some of them are: International Gutiar Competition Morelia (Morelia-Mexico), Concorso internazionale Joannes Brams (Acqui Terme-Italy), International Guitar competition Andres Segovia (Linares-Spain), International Guitar Competition de Vilches (Vilches-Spain), International Guitar Competition Magnitogorsk (Russia). He has been the Artistic Director of the international festival “Piani musicali” for 10 years.